The lines that divide reality from virtual reality were blurred June 18 by a pair of groundbreaking events at the inaugural Maryland Business and Accounting Expo. The workshops were examples of what are known as “mixed-reality” events – sessions that take place in real life and a virtual world simultaneously (see our post at www.slacpa.org). Those attending the Expo participated in the workshops in a real-life conference center; at the same time, people from around the world listened to the same speakers, viewed the same slides and asked questions from a virtual conference center in Second Life. Those with microphones could use Second Life’s voice functionality to chat with the presenters; those without microphones used Second Life’s chat application to ask questions and offer comments. , and California, drawn by the ability to attend an out-of-town CPE session without leaving their offices. The second workshop’s audience was even more far-flung, with people attending from a number of U.S.states as well as the United Kingdom, the Netherlands and Estonia. Audience members included Accounting educator’s, students, CPAs, State CPA Society Staff, and business people. The events were the latest of the MACPA’s “mixed reality” events. In January, the association hosted an event simultaneously in real life and Second Life as part of its annual Educators’ Conference. In March, the MACPA hosted a similar event as part of the CFO Rising Conference in Orlando. Special demos have taken place for Towson University and Johns Hopkins’ Carey School of Business. Upcoming “mixed reality” events include a session for the Association for the Advancement of College Schools of Business (AACSB) International Conference in St. Petersburg, Florida on June 30th and a session on XBRL in San Francisco with the SF Financial Executive Networking Group (SF FENG) on July 15th (details can be found on our blog www.cpaisland.com). The sessions are making a prophet of John Zdanowski, chief financial officer of Linden Lab, the company that created Second Life. Zdanowski, who presented “The Virtual World of Second Life” from his Second Life offices, addressed a virtual MACPA event earlier this year and said, “In the future, as the technology continues to improve, I expect to see virtual worlds become immersive experiences that are difficult to differentiate from the real world." He also predicts a time in the not-too-distant future when the use of virtual worlds is as prevalent as the use of e-mail today. Make no mistake: It's difficult to ignore Second Life's business potential. According to Zdanowski, Second Life residents spent more than 28 million cumulative hours in the virtual world in February alone, and they own more than 1 billion square meters of virtual space. More important, they have created almost 200 terabytes of digital goods, with more than 50,000 "in-world" businesses claiming virtual profits. 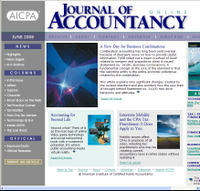 A recent Journal of Accountancy article offers further details about Second Life’s economy and business potential. In short, virtual business is soaring, and that means it’s time for CPAs to pay attention. Just ask Byron Patrick, information technology director at Katz, Abosch, Windesheim, Gershman & Freedman, which in 2005 became the first CPA firm to establish a presence in Second Life. Last week we managed to pull off two "mixed reality" sessions as part of our first ever Maryland Business & Accounting Expo at the Baltimore Convention Center. The two sessions were perfect for the show's theme of Innovation & Growth - Finding & Seizing Opportunities. Intuit kicked off Day 2 with their session on the Future of Small Business - a report they sponsored with the Institute for the Future. They were daring enough to attempt this live at the EXPO and in Second Life and by all accounts it was a success. Our virtual audience included about thirty-five avatars from all over the world! In addition to seeing what small business will look like in 2017, there was advice for CPAs in what they should be thinking about when serving these new businesses. I can't help but point out that in the study (Phase 2 Technology), there is a big piece on virtual worlds and small businesses and a specific reference to Second Life. Later that afternoon we had a repeat performance by Zee Linden (John Zdanowski) and Sue Linden (Sue Singer) of Linden Labs doing a session on the Virtual World of Second Life. John was virtual from his offices in California and Sue was live on-stage in Baltimore. Both were on-stage at the BLI Conference Center on CPA Island. Zee and Sue gave a great overview of how Second Life is being used for real business and non-profits and educational uses. 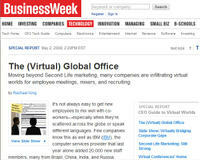 Check out the latest edition of Business Week where they have the CEOs guide to Virtual Worlds. The guide talks about how many companies have gone beyond the marketing aspects of Second Life to virtual meetings, conferences, mixers, and meetups. And don't forget recruiting and virtual job fairs. Then there is the report on the Future of Small Business sponsored by Intuit Corporation and done by the Institute for the Future. In that report (Part 2 - Technology Trends and Small Business) they talk about "Beyond Web 2.0 where these emerging virtual landscapes will drive small business formation, operation, and innovation... Virtual worlds will be widely adopted venues for reaching customers and experimenting with new product ideas and business models." If you add that these virtual worlds will be very familiar to the newest generation of workers (Gen Y, Millennial), many of whom grew up on MMORPGs (massively multi-player on-line role playing games) like World of Warcraft, then you can see why we have started exploring the virtual world of Second Life for CPAs. The latest edition of the Journal of Accountancy has an article, Accounting for Second Life that chronicles our efforts to explore how virtual worlds can be used in the CPA Profession. We are finding that the Business Week guide is right on point - social networking, meetings, conferences, and meetings are enhanced with the features of virtual worlds. There is another important dimension that should not be overlooked - they are also FUN! 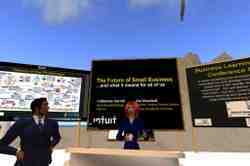 Intuit's Future of Small Business Report and What it means to CPAs: June 18 8:10 to 10 a.m. EST, 5:10 to 7 a.m. SLT / PST. Steve Blundell, CPA, and Catherine Harrell will present Intuit's three-part study authored by the Institute for the Future. The presentation will look at the significant trends and forces affecting entrepreneurship over the next decade, including the changing face of small business, technology trends and their impact on small business formation and operation, and how these concepts are shaping an environment where small businesses can thrive, benefiting from collaboration with big business, access to enhanced computing power and a global marketplace. 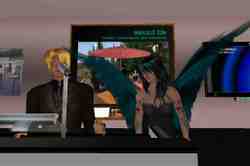 The Virtual World of Second Life: June 18, 2:15 to 3:05 p.m. EST, 11:15 a.m. to 12:05 p.m. SLT / PST. Johns Zdanowski, CFO of Linden Lab (the company that created of Second Life), will present from in-world to take you into a future that is already here, where real business gets done in virtual worlds like Second Life. If you think you have enough to do in this life, you may need to step out of your comfort zone and find out how real money is being made in virtual worlds. Plans are already under way to host a session on XBRL in the next month. Join us in-world at CPA Island for the first virtual tradeshow for accounting and business and the first CPE in Second Life on June 18 at the BLI Conference Center on CPA Island. To visit CPA Island, you must be a member of the SLACPA in Second Life. Once you have created your avatar, join the group "SLACPA" (it is free) and you will get announcements and instructions to sign up for the virtual sessions. 2.Select Edit -> Groups from the top menu, then click the "Search" button and enter SLACPA (short for Second Life Association of CPAs). 3.When the SLACPA group appears, click the "Join" button. This will give you permission to visit CPA Island. It will teleport you directly to the conference. 5.Alternatively, you can select "Map" button at the bottom of the Second Life screen, then enter "CPA Island" in the search box and click the "Search" button. Double-click "CPA Island" in the search results box and you will be teleported to the welcome center on CPA Island. 6.Look for a wall of signs and select the BLI Conference Center picture with your mouse. Right-click and select "Teleport," and you will be placed at the entrance to the conference center. 7.Proceed through the lobby and follow the signs to the conference center.